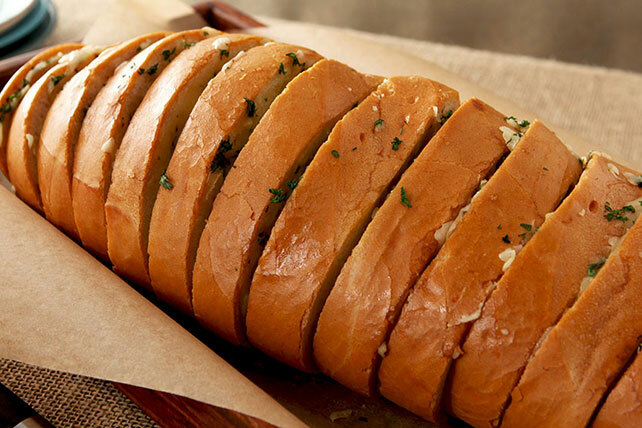 Imagine a cheesy garlic bread loaf wrapped in foil and baked until fragrant and delicious. That's what you'll get with this Hot Cheesy Garlic Bread Recipe. Combine all ingredients except bread. Cut bread into 3/4-inch-thick slices, being carefully not to cut all the way through to bottom of loaf. Spread 1 side of each bread slice with cheese mixture. Wrap in foil. Bake 25 min. Serve warm. Enjoy a serving of this cheesy bread as part of your meal. Prepare as directed, substituting 1/2 tsp. garlic powder for the minced fresh garlic, and 1 tsp. dried oregano leaves for the parsley. Substitute fresh basil leaves for the parsley.